Yes - I just finished working through Breaking Free. Everyone's journey is different. What is necessary and brave for one person will look completely different for another. But God wants us all to come to freedom with him. I love your honest, brave words today. And I'm glad you linked up at Three Word Wednesday. Too often I let circumstances cause me to live in a spirit if poverty, acting like an orphan because I doubt His care and love for me. Time to live in His freedom and truth daily. I so needed to read this today. Thank you so much for sharing. Awesome story! I can't wait to listen to the message. I am currently in training with the Unbound ministry (heartofthefather.com) to learn their model of healing & deliverance prayers. Your post really resonates with me and with what they teach. Forgiveness and repentance of whatever is in our past are two keys to freedom in Christ! I found your page through Winsome Wednesday's blog hop. Stopping by from Three Words Wednesday. Thank you for sharing. Alecia...this was so beautiful. And truth giving, setting free, wonderful!! God has recently in the last month spoken this to me and it was great to have another reminder. Bless your sweet heart! Thanks! I think what we often forget is that God ALREADY shut the door on our past. Closed it as far as the East is from the West. And we keep trying to pry it back open. 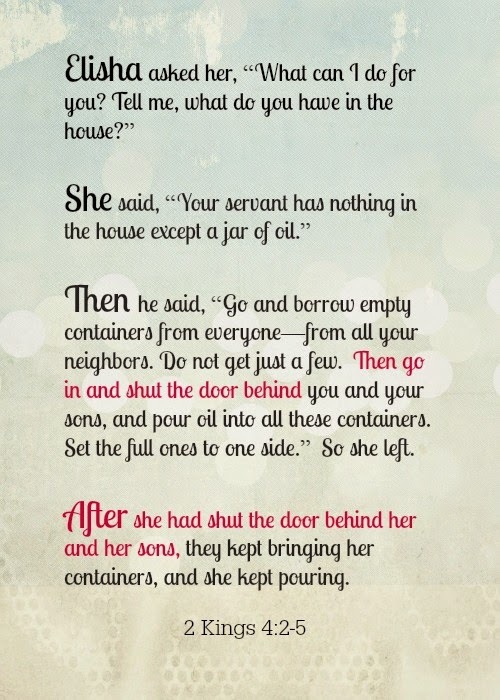 But I love the Scripture you shared and how the ABUNDANCE lives on THIS side of the closed door. So glad I stopped by from Three Word Wednesday, and I look forward to reading more from you in this community. That's right, as far as the East is from the West, if only we could always keep that visual distance in our minds. I'm glad you stopped by as well, it's always good to meet new faces! I'll be popping over to your place shortly! Thank you, Tracy. I hope so! I'm honored God used these words to speak to you. That is always my hope when writing. God bless, Sheila! Hi De! I look forward to checking out 'Heart of the Father.' I love when God speaks the same across the board, you really know He wants to get His message across when this happens. Hi, Dianna! I'm so glad God let you by here today and that this message was for you. Hey Beth!! So good to see your beautiful smiling face over here. I will collect on that hug one day, muah! tears, I will read this again. I can relate with all of it. I, not unlike you, don't like to draw attention to myself so responding to an altar call is not always easy. Yet when God says move He always has a reason. It's like the act of leaving our comfort zone cements the work He is doing in our heart at that moment. Good words here today! Thank you, Alecia. I appreciated your honesty here, and the pastor's heartfelt story too. What a powerful message, Alecia! I am so thankful that we are not who we were, that we are not our mistakes, that we can move forward in freedom! Blessings and good for you for obeying his moving in your heart. Wow! I love this! It is so easy to let our past not just influence but totally control our present and our future. This is a great reminder that we don't have to live there. We can choose differently. more seems to never be enough does it? thank you for this post. I pray that it encourages so many! Hi Alecia. I am also the spiritual leader in my family. It's extremely difficult but I keep trying and trying and trying to train them up right (my kids AND my husband). The rest is in God's hands. Thanks for sharing this powerful post, Alecia! So many wonderful truths to let soak into our spirits! God bless. I am glad you chose to listen to the Lord and got out of your seat and not remain. It behooves each of us to move when the Spirit of the Lord says so. It is not only for our benefit but for the benefit of others.